For educators, administrators, community service personnel, law enforcement, public officials. Upon completion of this 8 hour-training certification (credential) from the The National Council on Behavioral Health for 3 years and will allow you to become first responder to mental health issues and crisis situations. Mental Health First Aid is a public education program that introduces participants to risk factors and warning signs of mental health problems, builds understanding of their impact and overviews appropriate supports. This 8-hour course uses role-playing and simulations to demonstrate how to offer initial help in a mental health crisis and connect people to the appropriate professional, peer, social and self-help care. The program also teaches common risk factors and warning signs of specific illnesses like anxiety, depression, substance use, bipolar disorder, eating disorder and schizophrenia. 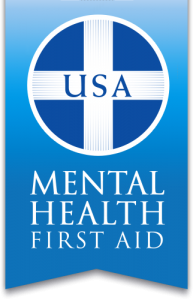 Mental Health First Aid is included on the Substance Abuse and Mental Health Services Administration’s National Registry of Evidence-based Programs and Practices (NREPP). Like CPR, Mental Health First Aid prepares participants to interact with a person in crisis and connect the person with help. First Aiders do not diagnose or provide any counseling or therapy. Instead, the program offers concrete tools and answers key questions like, “What do I do?” and, “Where can someone find help?” Certified Mental Health First Aid instructors provide a list of community healthcare providers and national resources, support groups and online tools for mental health and addictions treatment and support. All trainees receive a program manual to complement the course material. ALTHOUGH IT IS NOT REQUIRED 1 (one) hour of undergraduate or graduate college credit will be provided from Marietta College for a fee of $475 email Dr. Bauer if interested.